This group came together through the city’s coalition of civic leaders, educators and organizations known as Norwalk ACTS. Named TEAM Summer, the group has the mission of not just closing the learning gap but also lessening the opportunity gap among socioeconomically disadvantaged children in the summertime. Of the 1,300 district students TEAM Summer surveyed last year, about 56 percent did not engage in a summer learning program. Other data points reveal a lack of middle school summer learning activities and the large issue of transportation to and from activities, said Kate Ritter, lead of TEAM Summer and associate director of strategy and operations at Norwalk ACTS. “Instead of making the conversation around summer slide and closing the gap, it’s also about how summertime is an opportunity to provide more experiences for kids and that summer is a time for increased strength, so to speak, so that kids can do things differently, learn differently,” Ritter said. 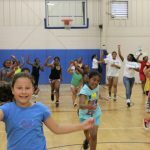 One way TEAM Summer is looking to close that opportunity gap is by providing an online directory of different summer learning programs available across the city. This year’s portal is now online, with more than 60 programs listed in academics, arts and culture, enrichment, sports and STEM — regardless of whether or not the provider is a member of the Summer TEAM initiative. Paula Palermo, the data director of Norwalk ACTS, developed the portal last year and has also led the data collection on summer learning in Norwalk since TEAM Summer started in 2017. Both are the first of their kinds in the city that Palermo are aware of. Amy Jefferies, manager of youth development at Family & Children’s Agency’s ASPIRE program, has seen the benefit of being a part of TEAM Summer firsthand and Norwalk ACTS since its beginning. Every summer, the Norwalk Library Association comes to the ASPIRE program to talk about its reading summer program to children, which boosts their motivation to read, she said. TEAM Summer now has 34 members and has an average of 30 people who come to monthly meetings. To view the Norwalk ACTS 2018 TEAM Summer Program Portal, visit http://www.norwalkacts.org/teamsummer/2018-portal/.